In 1964 my Mom gave me her old camera, a 6 x 9 metal box camera; Dad had purchased it at the Army PX at the end of the War. 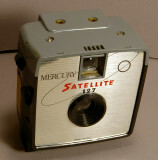 As a replacement, Mom got herself a new Mercury Satellite for 127 film, made in Chicago by Imperial Camera Company. She used it for years during family events and vacations. The Satellite disappeared for several decades. Then my sister found it while organizing things in our old house back in Pennsylvania, and she handed it over to me last summer. 127 film these days is difficult to locate, and even more difficult to get processed. I wanted to see how well the old Satellite would actually perform, so I cleaned it up, then made modifications for it to accept readily available 35mm film. This morning I loaded her up with a roll of Kodak Gold 200 print film and made a run Downtown. The weather was sunny, but with some ground level haze, resulting from our recent snow melt. It provided a lot of "atmosphere" for my test. Images were interesting, but a bit soft. That is often the case with simple single element lenses, and camera bodies with single shutter speed, aperture, and fixed focus. But the old family camera had a great time doing its thing after a long retirement. Nice 'thinking outside the box' (camera), Ed! AnNother 'engineering triumph'! Good work Ed. Nice pictures too. Brings back old memories! Thanks Again! I always enjoy your photos, Ed. In some ways it is amazing that people were ever able to take good photos with such cameras but you show that it can be done. 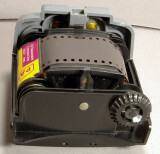 By the way, as far as 127 film goes, have you considered cutting down 120 with a slitter and re-spooling? It looks like Mom's camera had a great time. I am sure that you had a special connection when using it also. I remember that type of camera.....some great shots you took with it! #12 has interesting,I do love the old train station complex, pleasing angles and of course I love the window in #25. Glad they took the plywood off of it and cleaned it up.